Cemas is located in Istanbul, Turkey and this Turkish company imports, exports and manufactures it’s own machinery products, but also offers stunning backgammon boards. 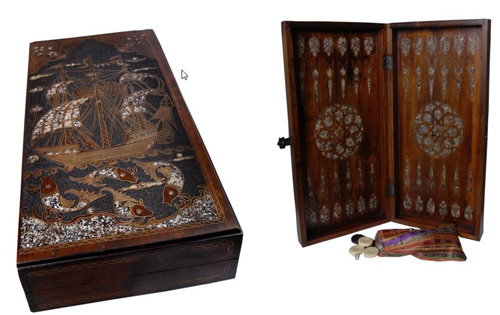 These top quality backgammon boards are handmade and are literally a piece of art. The luxury boards are made from walnut tree and include handmade brass filigree and original inlaid with genuine, mosaic mother of pearl made from the Red Sea Oyster. To give each board a luxury look, they are carefully handpainted with olive oil. The final board is incredible with such attention to detail and expert craftsmanship. These custom, handmade backgammon boards are available in various designs and sizes. Each creation would be a focal point in your home, office or even in a hotel lobby or game room. The ultimate in luxury decor. If you want to receive additional information about the handmade boards, contact us today. Follow our luxury blog for other luxury related news and industry announcements.